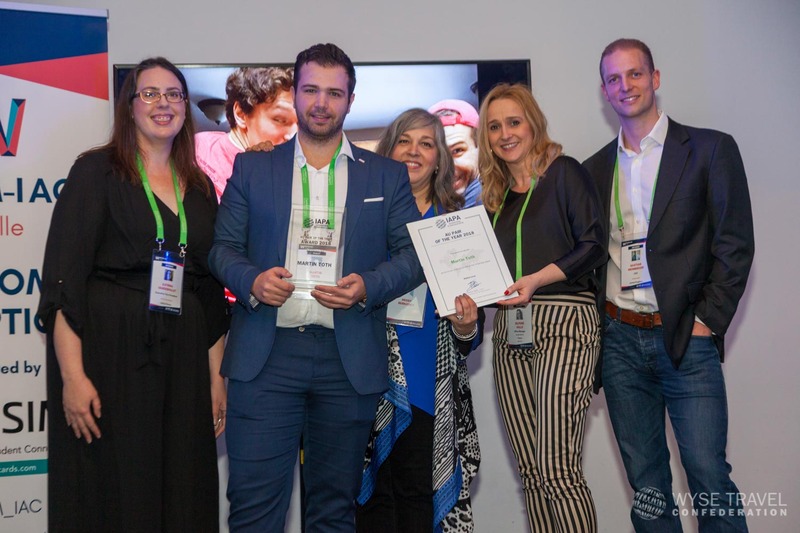 Hungarian au pair, Martin Tóth (25), received the IAPA Au Pair of the Year 2018 Award during the opening reception at the Metropol Parasol in Sevilla during the Work Experience Travel Market and IAPA Annual Conference (WETM-IAC) 2018. An international jury of five people had selected him from over 30 nominations. Martin was placed by receiving agency, Au Pair International from the USA. His sending agency had been Smaller Earth from the UK. His American host family from Houston, TX, the Bernosky family nominated him for the award. Already the family in Washington D.C. that hosted him during his first au pair experience had suggested this exceptional young man as Au Pair of the Year. His time with the Bernosky family in Texas had started quite roughly as the family’s neighborhood was hit by Hurricane Harvey. Martin was the “rock” of the family: he did not have to think twice and simply did what needed to be done. During this difficult time, Martin proved what a great personality he has and how much he had immediately become part of this family. Martin held a very passionate speech without any notes and told the audience who listened holding their breath, about his first weeks in Texas, his au pair experience in general, and his wonderful, warm-hearted host family who has such a big heart. He shared how the Bernosky family helped the whole neighbourhood and simply let them all stay with them even though their own house was partly destroyed. Missy Bernosky accompanied Martin to this important event in Seville. With her emotional speech and her description of the relationship her family has built with Martin over the last months it became very clear that Martin was indeed a well deserving winner of the Award. The audience was thrilled with their speeches and moved by a surprise video created by the teenage children and the host father to congratulate their beloved au pair, Martin, which also brought Martin and his host mother to tears.